Next up is the go kart brakes. This guide shows how to attach the 4 inch brake band to the kart, fabricate the brake rod, and attach the brake rod to the pedal. 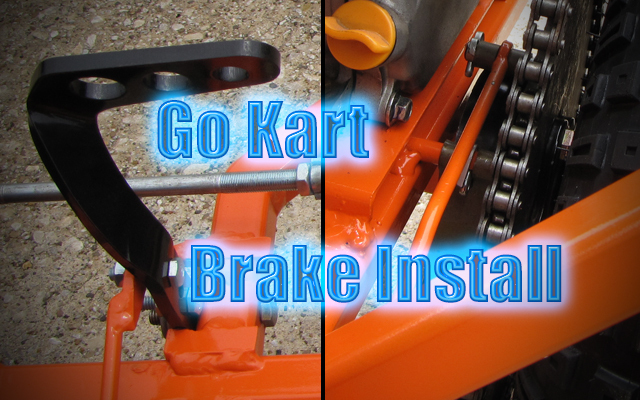 Other materials needed to install the go kart brakes that aren’t in the go kart parts kit can be purchased at any hardware store such as a farm implement or big box store. I also got my steel at a steel distributor. You can get small amounts of steel at most hardware stores as well, but it does cost more. 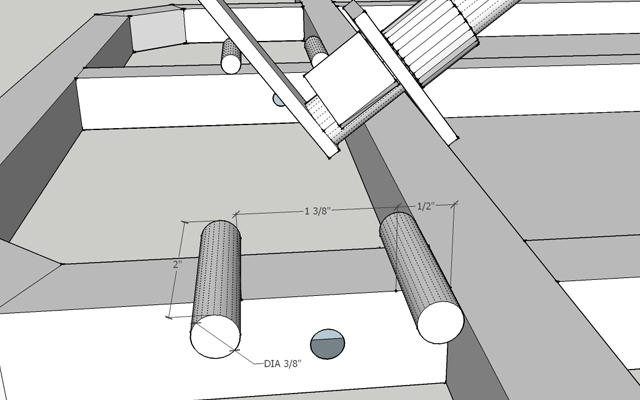 The edge of the dead axle tubing measures 1 1/2″ from the center line of the retaining stud. 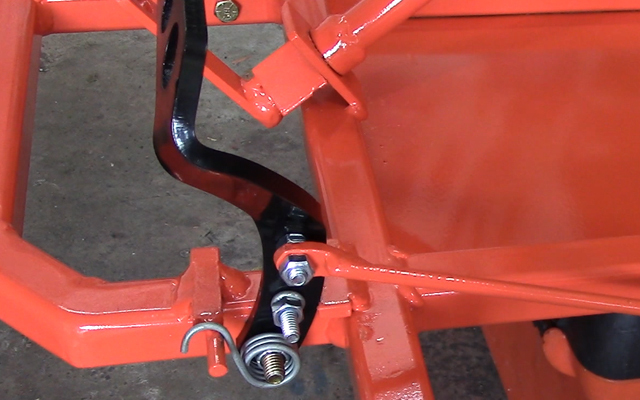 The stud lines up exactly parallel to the axle, being flush with the inside edge of the frame. I drilled a 5/32″ hole where the brake band should go for the cotter pin to go through. The go kart brake pedal assembly process includes involves cutting out the pedal stops. The pedal stops hold the brake rod in its ‘off’ position, as well as preventing the pedal from contacting the tie rods when depressed. You will need the associated nuts, bolts, go kart brake pedal, and return spring when assembling the pedal. 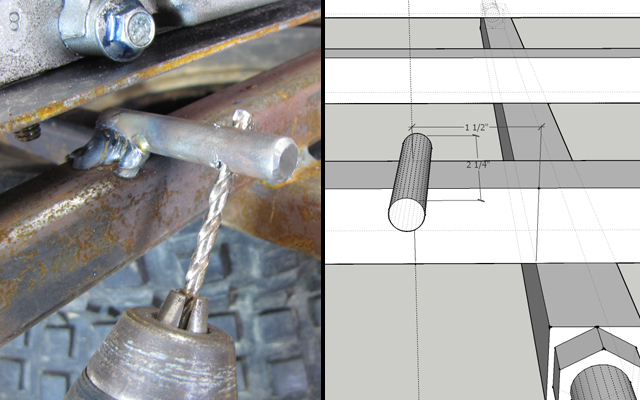 First, cut two 2″ sections of 3/8″ round bar, then weld them onto the kart frame. 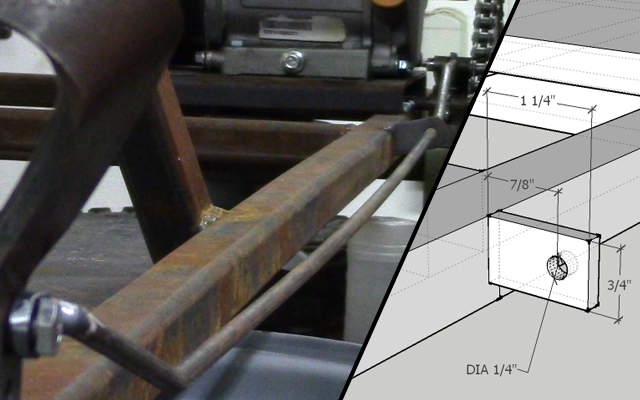 The first bar measures 1/2″ from the outside edge of the front axle to the outside edge of the round bar. The distance between the two round bars is exactly 1 3/8″. Ignore the discrepancy in the plans vs the picture. I already welded something else on it, only to realize the 3/8″ round bar was much easier to use and would fit the return spring much better. Tack weld the brake rod guide tab onto the kart. This is needed to keep the brake band from rubbing on the brake drum when the pedal is in the resting position, as well as keep the band from moving left or right when the pedal is depressed. Drill a 3/8″ hole in the 3/16″ plate. This will fit onto the cotter pin and join the go kart brake rod to the brake band. 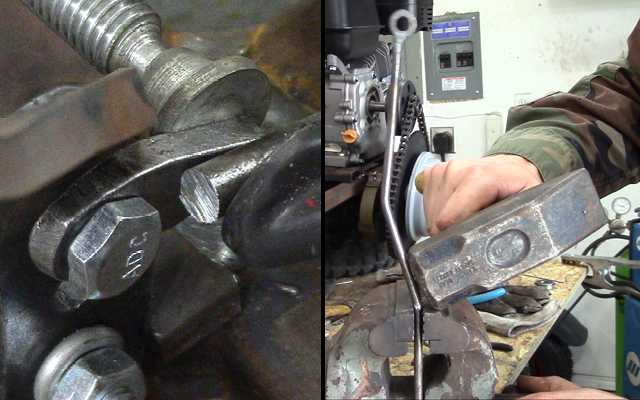 Grind off any excess steel, and weld it to the end of your 1/4″ round bar. Insert the clevis pin into the other end of the go kart brake band, including the end of the brake rod in the center. Secure the clevis pin and brake rod with the 1/8″ cotter pin, but don’t bend it into place yet, this will be done after the kart is painted. Hammer the 1/4″ round bar used as the brake rod material. Use a vise to hold the bar as you shape it to conform with the go kart frame. Then slide the round bar through the guide tab. Drill a 1/4″ hole in the 3/16″ plate and grind off any excess steel. This will be used as the other end of the brake rod that attaches to the pedal. 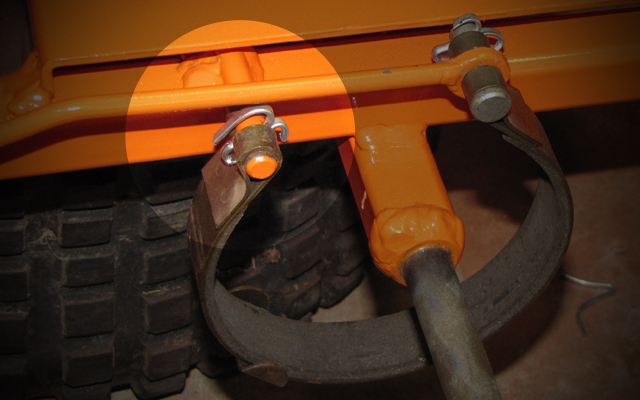 Adjust the brake rod so that the band is close to the brake drum when the pedal is in its resting position. Use a clamp to hold the brake rod to the plate, and operate the pedal to make sure everything lines up. Weld the brake rod to the plate. Make the final welds to secure the brake rod guide tab as well. 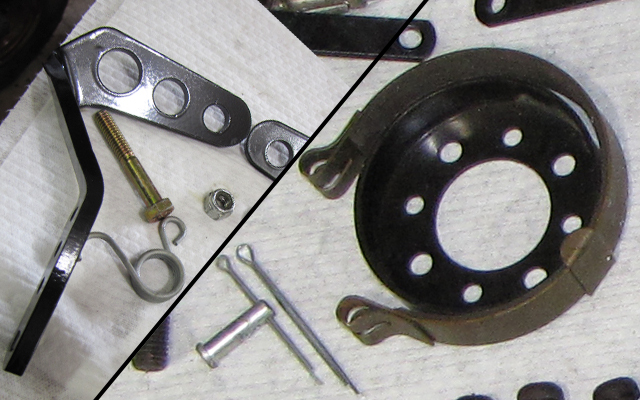 Now that you have the go kart brake assembly and setup complete, its time to focus on the throttle assembly. I’ve almost got the brake line done but I didn’t like the idea of a 1/4 inch rod so I made mine out of 3/8 inch rod and didn’t like the idea of adjustment by bending so I split the rod halfway and welded in a store bought turnbuckle after removing the eye and hook. That gives me 1 inch of adjustment either way for setup and wear. Hope this helps others. I am enjoying the build. Thanks. Is there anyway one of you can tell me where I can order one of theses brake lines? Or I will buy one from one of you all if you will make it. i noticed one of the differences between the standard and deluxe live axle plans is the use of brake band on the standard and disc on the deluxe. Can you use the disc brake on the standard? yes you can. I show in the plans how its done. i cant seem to find it in the standard plans. at the beginning it says that to use the disc brake and torque converter you need to use the deluxe plans. I have a fiberglass body i am putting on the lart and want a level wheelbase which is why i wanted to stick with the standard frame design but use the disc brake and torque converter. Where can I get the brake pedal return spring? I have the band and other parts I got from BMI karts, but I can’t find that spring on there web site. By the way, your videos and this site are Great!! I wish I would have found it before my son and I started this project. The link to the return springs is literally in the article, just look for the bullet point list of parts. Hi. Any guidance on installing disc brakes on the Standard Live Axle? Good idea? Bad idea? not a very good idea because of the ground clearance. The brake band is strong enough to lock the wheels if you stomp on the brakes at full speed, so its not inferior by any means for the tire size. If you really want to go disc, there is nothing stopping you, except a rock or bump that the disc may hit instead of the tires. Hmm, I haven’t had anybody else run into this issue. However, what you can do is put thread-locker on the bolt and it will hold it in place, even if it is just a couple of threads on. Also, can you do me a favor and measure the length of the rim from bearing to bearing? I would like to know if that part has changed in length. Every once in a while, the go kart parts store gets new supplies that are not the same as the rest (e.g. steering wheel changed from original). Hey from bearing to bearing is 2 -7/8” I got a smaller nut to go on almost flush with axle.I also have machine washer inside & out of wheel .The nut I was using is 3/4″ wide nylon lock which is to wide I guess.Well the next one i will weld on 5″ bolt so I can use nylon lock nuts Thanks again. What is the weight of the chasis and of the motor. What is its rpm?. But can i get all thee parts with length in Meters, To cut everything. Just convert them on google.